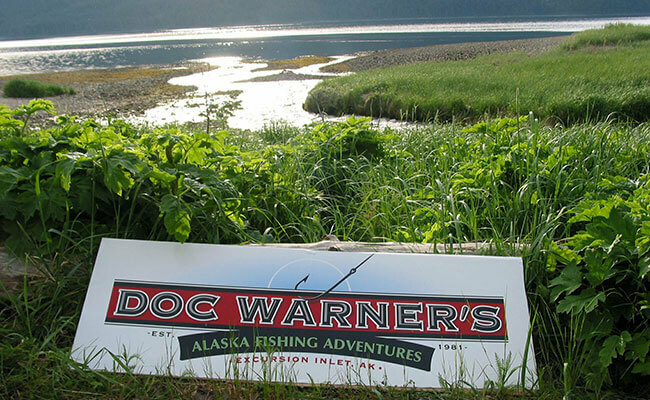 Located about 30 miles west of Juneau, Doc Warner’s lodge is situated along the shoreline of Excursion Inlet. It is nestled amid the towering peaks of the St. Elias Mountains in Southeast Alaska. Gustavus, headquarters for Glacier Bay National Park, is a short 12 miles to the west. Doc Warner’s guests are treated to vistas of majestic snow-capped mountains, glacier laden valleys, and verdant conifer forests carpeting the steep and rugged slopes. In addition, the deep blue and often placid waters of the Pacific Ocean are tucked behind the shelter of numerous barrier islands with a picture-perfect backdrop of azure skies punctuated with fluffy clouds. Click here for a topological map of the area; an aerial photo can be seen below.